Horse around in China’s first-ever equestrian club. 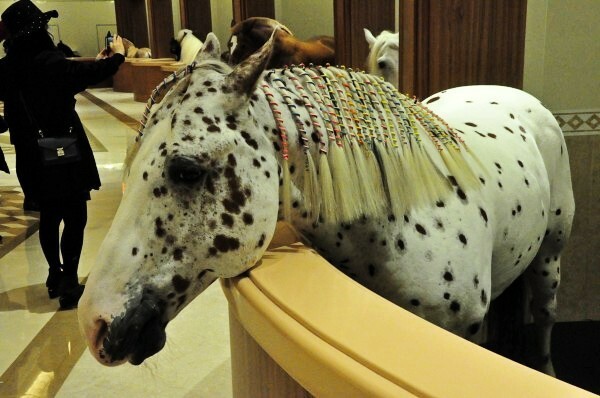 Located about an hour north of Shanghai, the Heilan Equestrian Club is a marble palace where horses hang out. Known as the “Horse Culture Museum,” the gorgeously designed building in Xinqiao Town provides ample opportunities for human visitors to interact with the club’s equine residents. 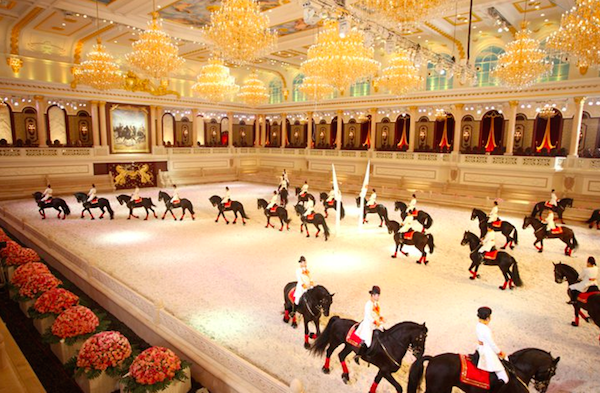 Heilan is China’s first-ever comprehensive equestrian facility and is notable mainly for its sheer opulence. Clubs like these are uncommon in the States, but internationally, there are a handful of others (see: the Jockey Club Córdoba in Argentina or the Adana Equestrian Club in Turkey). Spread out over 400 mu (almost 66 acres), Heilan features competition venues, the largest horse training gymnasium in Asia and an equestrian show arena. When you’re done horsing around, there’s ample opportunity to relax — the club offers a themed bar, a restaurant, and even a hotel. The club opened in 2010 and, according to Heilan Group President Zhou Jianping, was built to “actively promote the equestrian sports.” The facility houses more than 50 horse breeds, including Hanoverian, Friesian, Andalusian, Lusitano, Lipizzan, American Quarter, and Orlov Trotter. Heilan’s official Facebook page states that some of the horses hail from Xinjiang and Beijing. The club imported others from countries like Germany, the Netherlands, Spain and Portugal. Saddle up, because Heilan isn’t just some palace with horses in it — the club also holds a Guinness World Record for the largest horse dressage (a highly skilled, competitive form of riding) ever attempted. Heilan’s dressage lasted 6 minutes and 27 seconds, and involved 60 horses. 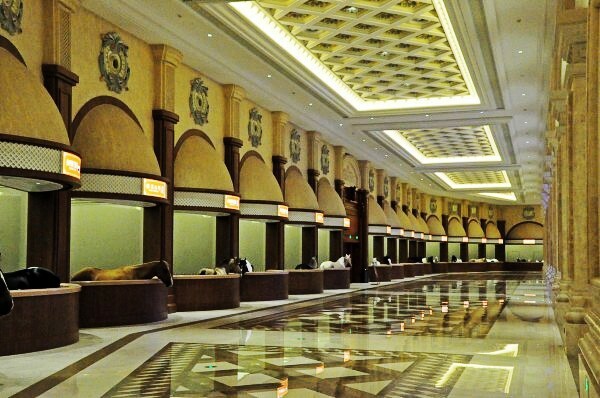 If it weren’t for the horses, a person could easily mistake the space for a royal palace. Most likely, the animals don’t stay in the museum full-time (as evidenced by this photo of a less glamorous space at the club). 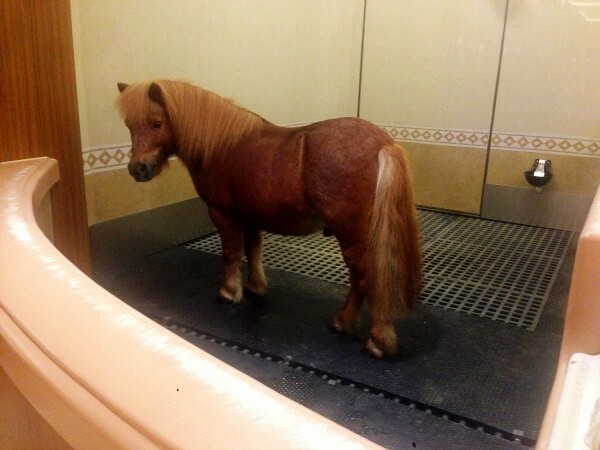 Even so — these horses are living large. The club employs nine senior horse-training coaches, 36 professional trainers, and has over 100 registered club members. According to 517 Huwai, membership costs 380,000 yuan (or 55,000 U.S. dollars). If you’re interested in becoming a member or scheduling a visit, check out the club’s website. Next time you visit Shanghai, make sure to schedule a trip to the Heilan Equestrian Club — it seems like a once-in-a-lifetime experience!